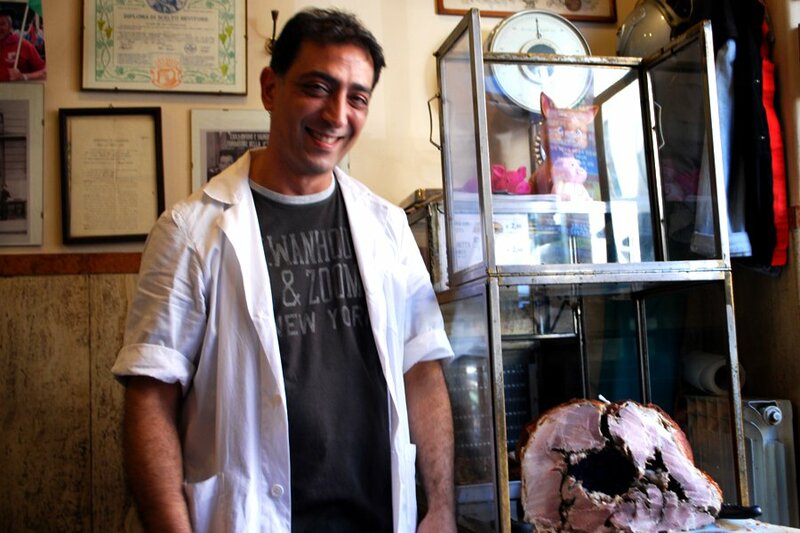 The man who served the porchetta, and the only person working at the time. Photos by Anne Roderique-Jones. A New York City writer happens upon a local spot at lunch in Rome. And so begins a love affair with a porchetta sandwich from heaven. ROME – Their pig is a beauty queen. She is placed front and center in a glass case to be admired and adored. She's been gutted, de-boned, and lovingly stuffed with rosemary, fennel, and garlic; but it's her crispy skin that's to be exalted. It's crackling, hard, and ruddy-colored — the most sought-after piece. Those crispy bits marry with the moist, juicy meat. She's placed on a sheet of parchment paper that will also serve as my napkin, so that I can sop up the drippings. But the chewy ciriola bread should serve the same purpose, acting as a pillow-soft bed for the pork. This pig is no ordinary pig. She's porchetta from Er Buchetto. On our first visit to Rome, my husband and I tirelessly navigated one awe-inspiring historical sight after another. 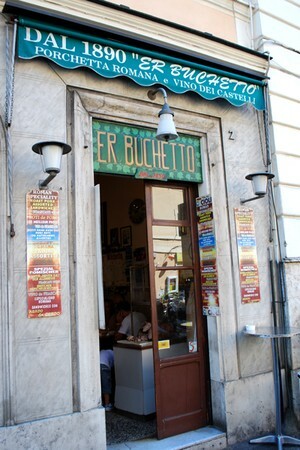 On a particularly tourist-heavy day, we stumbled upon Er Buchetto in Termini. 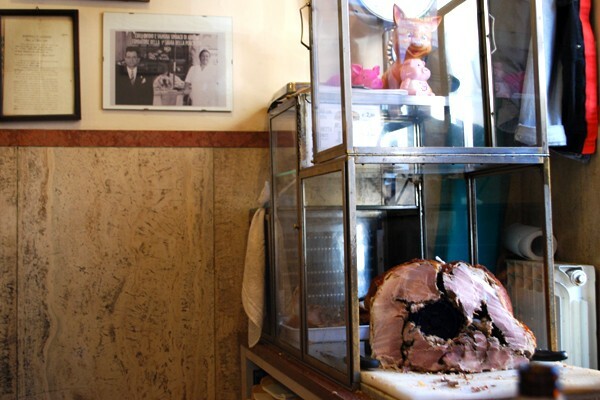 It was not in our trusty guidebook, this minuscule hosteria that serves only porchetta — a pork loin sandwich stuffed with its own herb-y innards and roasted over burning, hot coals. The sandwich originated in central Italy as a celebratory dish, and it was the perfect respite after our day of playing tourists. There was a line. After hours of line-waiting, it was a dreaded vision. But we did not falter. This is a line of locals that moves quickly, and the thick, savory aroma wafting out the door and beckoning us was only a tease for the goodness to come. 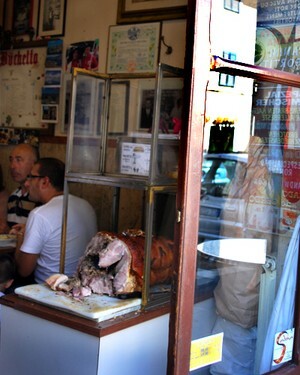 Once inside the hole-in-the-wall, we took our turn at one of the small, weathered tables inside the tight space that has been home to many Italian lunch-breakers, a few tourists, and a lot of beautiful pigs since 1890. The walls are oiled with sweet, sizzling fat, topped-off with proud photographs of happy customers and a few shelves scattered with pig propaganda. The concept of an open kitchen holds no more truth than it does here, where it's about the pig and only the prized pig on full display at the entrance. The edges of the store are for set for seating, with a few tables scattered about. Perched upon them are locals digging into their pork, careful not to grease the pages of their newspapers as they take full advantage of the long lunch hours. The back corner holds a metal sink for thirst quenching. One handle of the faucet pours white wine and the other, red. The ancient cooler stocks water and beer. We eat slowly. We enjoy. We savor. We do as the Romans do. The porchetta is ridiculously simple, yet undeniably unforgettable — as any good Italian meal should be. Anne is a freelance writer living in New York City. She travels for the sweet sound of unknown languages and boozy lunches.